I'm Looking For The Ultimate Camping Excursion Vehicle! What Car Should I Buy? Audrey loves to go camping. He was trying to make it work with his little Chevy hatchback, but he’s ready to treat himself to something nicer, bigger and ready for adventure. What car should he buy? I go camping a several times a year: sometimes plain old walk-in camping in local forests or campsites, sometimes bigger events like regional burns or festivals. When I started running a theme camp, I pretty quickly hit the cap in what my little chevy hatchback could carry, but I’m adverse to change so I just got aggressive about car Jenga. Recently I moved, and while now I have a rad studio, it’s further away from the bus lines, so my partner claimed the car for commuting. So right now I have no car, and the car I previously had wasn’t exactly suitable for my needs anyway. I’m looking for something that I can at least *make* visually interesting, that isn’t super hard to maintain. I’m willing to learn some maintenance skills, but I don’t know very much now and don’t want to invest in a car with a delicate constitution. It’s got to be able to manage rough but not wild terrain (windy backcountry roads, and narrow dirt paths, but not untouched country), so a good 4x4 is a must. The vehicle has to either a big enough interior to camp out of at events or enough towing capacity for me to pull a camping trailer behind me. I mainly work from home, but I do need to keep appointments and run errands, so it also needs to be a car that isn’t impossible for street and highway driving. I can spend up to $40,000, but I also don’t want something too big with bad gas mileage. An automatic is preferred but I would learn to drive stick if it came down to it. Audrey, so I’ll be honest with you on this one. If you are looking for a decent sized 4x4 that is capable off-road and/or has the power to tow stuff, you aren’t likely going to get great gas mileage. You are fighting physics and there is only so much you can do with a larger car. So you will have to settle for “decent” MPG. I say if the highway rating is in the 20s then you did okay. The good news is that it’s pretty easy to check the rest of your boxes. The ride that does it best is the Toyota FJ Cruiser. The FJ was Toyota’s retro-styled 4x4 that didn’t sell all that well when it was on sale from the second half of the second Bush presidency to the second half of the second Obama presidency. Now, though, it has a cult following and thus some pretty bonkers used car prices. But that is all for a good reason. this thing can crawl rocks, haul your gear, and according to the forums tow up to 4700 pounds. It also has Toyota indestructibility you would expect from similar 4x4s like the Tacoma and 4Runner. You could spend a lot of money on a low mileage example that is a few years old, but I say roll the dice a bit on an older model with reasonable miles like this 2009 for about $21,000 since it is pretty much the same darn car. That will leave you some savings for a new trailer and some cool gear. So you need space, you say? But also off-road capability? Well, you can buy an SUV and make compromises on packaging efficiency, or you can buy the Mitsubishi Delica, and make exactly zero compromises. Just look at the L300 model in the video above traversing ridiculously treacherous terrain. Have you ever seen a van do anything like that? Me neither. The L300 is basically a Mitsubishi Pajero with a bit more intelligent packaging built in, meaning you get four-wheel drive, a low-range transfer case and differential locks. Plus, seven-passenger seating! It’s the ultimate camping vehicle, and what’s even better is that they’re way under budget; here’s one for sale on Ebay for about 14 large. My initial thought was that you need a used Toyota Land Cruiser, a vehicle so well-built that they will be used in our eventual colonization of Mars. But the problem is that the only Land Cruisers that cost $40,000 are over-restored investment vehicles from the ‘60s and ‘70s that are basically Broncos but slower. All the really good Land Cruisers from the ‘80s and ‘90s are still too cheap. Everything on the market costs about $10,000 and has 200,000 miles on it, whether it’s just been daily-driven or modded to infinity. Given that you already know you could get a good FJ Cruiser if you want something relatively new or a Delica if you want something relatively efficient, it’s my duty to suggest something eminently practical: an off-road race car. Since you’re in SoCal, the market is flooded with all kinds of long-travel prepped trucks and SUVs built for desert racing. There’s probably a prerunner out there with your name on it, one that’s mildly built, reasonably new and exceedingly cool. To set your mind in the right direction, I’ll point you to this 1977 Chevrolet Suburban with the longest shocks I have ever seen. Sure, the engine has been moved halfway into the cabin, but think of how warm it will keep you in the winter! Wait, this only costs $4,500? Dammit! I still can’t find anything expensive enough. You know what are likely the most used, most capable, and most plentiful campers in existence? Ambulances! Think about it—an ambulance is a mobile, climate-controlled room, full of equipment and a bed. That’s a camper! 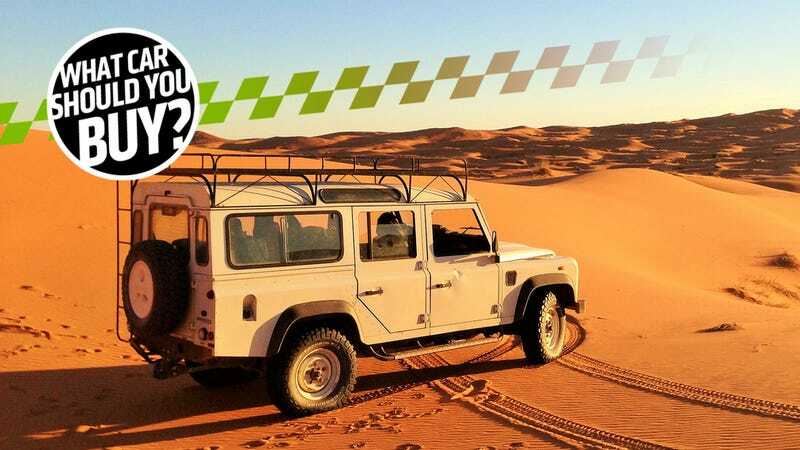 That’s why the only answer that makes any sense here is to find a used 4x4 ambulance, because it’s already a capable adventure vehicle you can sleep and live in. Without all the medical equipment and packets of bandages and syringes and stuff they’re full of useful compartments and closets, they already have a bed area, seats, counter space, and, best of all, you know they’ve been well-maintained, because, let’s face it, they had to be. Ambulances are built to last, not like some RV or consumer-grade crap: these things had to work in life-or-death situations, and they did. Plus, they’re full of lights and robust electrical systems that, if they could support a defibrillator, are sure as hell going to be able to keep your iPhone charged. This 2008 4x4 Ford F-350-based ambulance looks like a great deal at $34,995. It looks immaculate and only has 65,000 miles or so. The interior has tons of storage, there’s more cubbies and closets outside, and I think the blood pressure monitor is still installed. Also, check out that racy red stripe! I don’t think they’re including the gurney with your purchase, but I suspect that’ll be okay with you. There’s an even roomier and nicer one for $40K, but I figured you’ll want a few grand to re-decorate the place from its current ICU-chic look. An ambulance is absolutely the way to go here. Just don’t think about people who may have died in there.